Federal Judge Blocks Ohio's Lethal Injection Protocol : The Two-Way The judge rejected the state's use of midazolam, one of the drugs used in botched executions in Arizona, Ohio, Oklahoma and Alabama. The ruling puts Ohio's next three scheduled executions on hold. 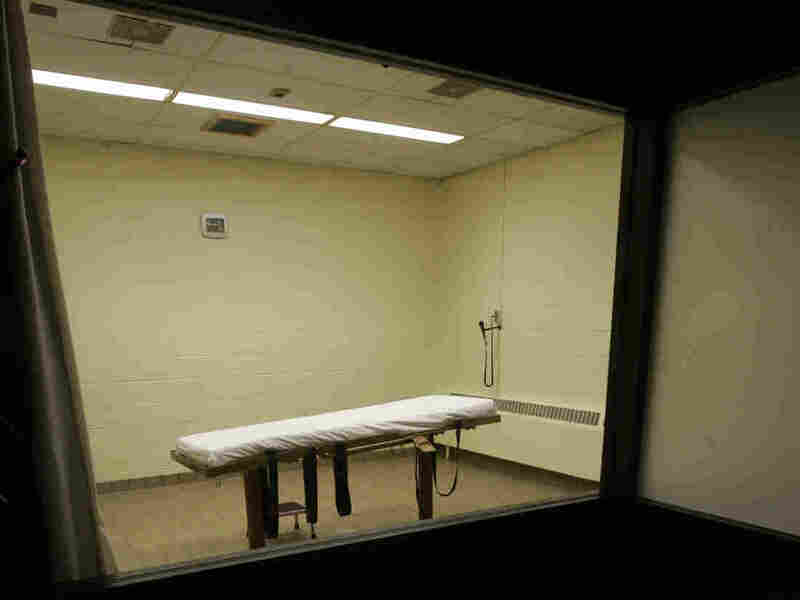 The death chamber at the Southern Ohio Corrections Facility in Lucasville, Ohio, as seen in 2005. A federal judge has rejected the state's lethal injection drug protocol, postponing three upcoming executions. A federal judge in Ohio has rejected the state's three-drug lethal injection protocol on the grounds that one of the drugs, the sedative midazolam, is not sufficiently humane in its effects. The drug has been used during multiple botched executions in Arizona, Ohio, Oklahoma and Alabama, as The Two-Way has reported. After five days of hearings, U.S. District Court Magistrate Judge Michael Merz blocked three upcoming executions in a decision issued Thursday morning, writing that the "use of midazolam as the first drug in Ohio's present three-drug protocol will create a 'substantial risk of serious harm' or an 'objectively intolerable risk of harm.' "
MAP: Lethal Injection By Far The Most Popular Execution Method In U.S. In December, Arizona announced it would no longer use the drug in executions, member station KJZZ reported. Ohio was the first state to use midazolam as an execution drug. Ohio first used it to kill Dennis McGuire on Jan. 16, 2014, in an execution that took 24 minutes and during which "McGuire started struggling and gasping loudly for air, making snorting and choking sounds which lasted for at least 10 minutes," according to a witness. The plaintiffs in the Ohio case are the next three people scheduled to be executed in Ohio in the first part of this year. Ronald Phillips was scheduled for execution on Feb. 15, Gary Otte on March 15 and Raymond Tibbetts on April 12 according to the Ohio Department of Corrections. Their executions have been put on hold as a result of Thursday's decision. In court filings, the prisoners argued that the use of midazolam violated the Eighth Amendment and amounted to a reversion to a "more primitive, less humane execution method," citing past executions involving the drug in which prisoners appeared to struggle, regain consciousness, writhe and die slowly over the course of minutes or even hours. Ohio's lethal injection statute requires "a lethal injection of a drug or combination of drugs of sufficient dosage to quickly and painlessly cause death." The U.S. Supreme Court ruled 5-4 in 2015 that using midazolam for executions did not violate the Constitution. However, as Judge Merz noted in his decision, the high court did not "logically imply that it can never be proven that midazolam presents an objectively intolerable risk of harm." As a result, Merz felt his court was free to evaluate the potential harmfulness of midazolam, despite the higher court's previous ruling. As we reported, Justice Samuel Alito wrote in the Supreme Court's majority opinion that "the prisoners failed to identify a known and available alternative method of execution that entails a lesser risk of pain, a requirement of all Eighth Amendment method-of execution claims." Merz wrote that such a method exists in the form of barbiturates, which were the lethal injection drugs of choice until pharmaceutical companies began blocking their sale for executions, as The Two-Way also has reported. "All the parties and witnesses in this case agree that use of a barbiturate, either as the first drug in a three-drug protocol or as the sole drug, would be preferable to the current Ohio protocol in that it would eliminate the side effects observed in midazolam-involved executions identified in the lay testimony and would also eliminate (or at least reduce to a constitutionally acceptable level) the risk of subjecting the inmate to severe pain." "The question, then, is the availability of barbiturates," he continued, explaining that there is no legal requirement that barbiturates be available in order to qualify as an alternative execution method. The state will decide whether to appeal the decision. There are currently 140 people on death row in Ohio.